If you’re vegetarian and you’re keeping an eye out to make sure you’re getting enough protein, give this recipe a shot. One of my goals this year is to use less jarred sauces and to make more of them from scratch. That said, I’m still not ready to make my own masala sauce, because I’m a newbie when it comes to Indian spices. So for this recipe I use a jar of Trader Joe’s Masala Curry. once the onions start browning, bring the cavalry. 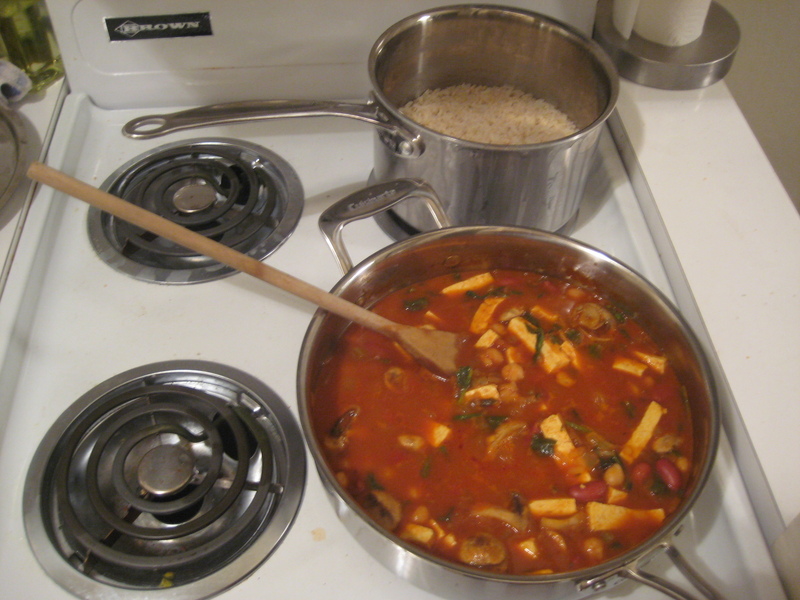 Add the jar of masala sauce, and add the chickpeas, tofu and mushrooms. You can add any other vegetables you have lying around. I’ve done this recipe a few times and I find that three vegetables is a good number, otherwise it can get a bit noisy. By noisy I mean you’re not sure if you’re eating a poor man’s chile con carne or Indian food. Make some brown rice (I use Trader Joe’s Thai brown rice) and serve and enjoy. I hope you like the dish. It’s a great source of protein and has good flavor. P.S. the pic below shows some spinach and red kidney beans. Again, adding some left over veggies I had in my fridge and violating my no-more-than-three veggies rule. Update: I found this great similar channa masala recipe but using less of the sauce, which makes a big difference.